After the close, Apple (AAPL) reported earnings that blew away analyst estimates by some $2B with earnings at $4.64 vs $4.06. The stock sold off some 6% though due to various 'concerns' such as weaker margins and iPad sales. Typical Wall Street action. Take astonishing bullish numbers and focus like a laser beam on a few minor concerns. Instead of explaining how revenue could beat estimates so badly with iPad sales some 600K weaker then expected. Or explaining how supply constraints due to the overly successful launch of the iPad likely lead to the weakness and how it might be overcome in the coming months. Or figure out how iPhone sales coming in at a strong 14M+ will lead to future iPad sales that could someday surpass the iPhone numbers. All in all, the stock reaction in after hours is nothing more then profit taking. Clearly the numbers were blowout and signal the trend higher continues. The $500 target just reported on last week remains intact and even solidified with these numbers. Its very important to distinguish between profit taking on a good report and a sell off from a bad report. A bad report needs to be avoided while a scenario like AAPL's should be bought. Another key is that an investor must know the real value of a stock. Is it trading at lofty valuations so that bad report might signal the top? Or is it trading at reasonable values to where a sell off is a load the boat moment? In the case of AAPL, the stock after hours trading at $300 sells at sub 15x eps estimates while growing easily at 20%+. We'll just ignore growth above 20% (net income up 70% this Q) and assume its not sustainable for a company the size of AAPL. Using 20 though, AAPL should trade over $400 based on earnings that will likely hit $22 in the current year now that AAPL has reported Q4 numbers. Highlighting another important factor in valuing them. Now that estimates for FY 2012 will roll onto earnings boards like the one on Yahoo! Finance, investors will begin focusing on future numbers that will be considerably higher. Don't get shaken out of this true value. For the fiscal fourth quarter ended September 25, the company posted $20.34 billion in revenue, with profits of $4.31 billion, or $4.64 a share, ahead of the Street at $18.86 billion and $4.06 a share. The company’s own guidance had been for $18 billion in revenue and profits of $3.44 a share. After tax profits and revenue were both records. Gross margin was 36.9%, down from 41.8% a year ago. The Street had expected margins of about 38%. The company sold 3.89 million Macs, up 27% from a year ago. Apple sold 14.1 million iPhones, up 91%. The company sold 9.05 million iPods, down 11%. It sold 4.19 million iPads in the quarter. 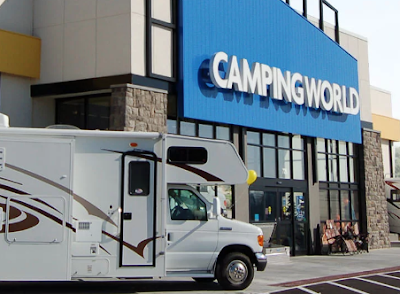 Camping World announced a major reorg including the hiring of a new CFO. The sudden resignation of the President of RV Operations looks more and more like a personal decision due to a disagreement with the organizational shifts and his new place in the business. The stock is up about 5% to $12. Considering these reorgs usually occur when business is struggling, the recommendation isn't to jump into the stock on the rip. Continue to use dips to buy Camping World for the long term as 2019 could be another rough year. The last thing a weak stock needs is an executive departure. Camping World (CWH) is crashing to new lows based on the surprise resignation of the President of RV Operations. Lam Research (LRCX) reported a strong quarter after the close and the stock is up about 5% in initial trading. The company provided the market with $5 billion reasons to own the stock. Massey Energy Worth $60+ in a Buyout? Apple Clears $300.... Still Cheap! Why is FASB Reconsidering Mark- to-Market? Goldman Sachs Triple Top Breakout?